Faced with additional cuts in its budget, Executive Fire Commissioner Donald Austin has proposed an easy way to save money: let buildings burn down. Austin would like to allow such drastic action if the building is over 50 percent ablaze and does not endanger surrounding dwellings. In the meantime, Baltimore is looking into advertisements on the side of fire trucks. They are the latest examples of the insanity that has taken hold of this country as we burn hundreds of billions in Afghanistan and Iraq because our leaders have lacked the courage to withdraw forces from those countries. Instead, we will allow buildings to burn down while building facilities for Iraq with one of the world’s largest oil reserves. Previously, Detroit led the nation in securing the right to bulldoze whole blocks of vacant buildings. Currently flying over Detroit is like looking at pictures from Berlin after the bombing in World War II. The city is also looking at bulldozing an additional 10,000 buildings. Indeed, the fire department is advocating the creation of a demolition unit that will simply tear down rather than save a burning building. The fire department would change its historic role in saving buildings into a department committed to the destruction of unwanted buildings. Fires then become a welcomed opportunity for urban renewal. It may come a surprise to neighbors when the fire department arrives and promptly seeks to destroy the endangered building. It is also unclear how this decision would be made at the scene. 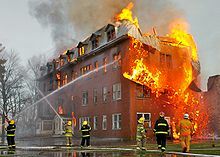 I have serious legal reservations about a fire captain making the determination of both the extent of the damage and the status of the building as an unworthy or vacant structure. All of this would have to be done at the scene as the building burns. As for Baltimore, it is not clear what products would want the ad space on a truck that is generally seen in the midst of a tragedy in the making. Chili’s and Red Hots come to mind, though insurance companies may be drawn to the captive audience of fire victims. As we have seen, it is not just Detroit that is burning down. Cities and states across the country are slashing core programs and selling off parks and government buildings to cover their budgets as Congress and the White House continue to write checks for these wars abroad — while discussing the possibility of a war with Iran on behalf of Israel. It is unclear when the American people will say enough, but it is a testament to the strangle hold of the two parties on this country that we are discussing letting buildings burn rather than deal with billions gushing abroad in disastrous wars. Pingback: Detroit Has No Horses But Pays $56K for Horseshoer — Union Boss Says It‘s ’Not Possible’ to Eliminate Positions « Be A Patriot!